Well I did it. I mentioned in my previous post that it had always been a dream of mine to compete in a triathlon. 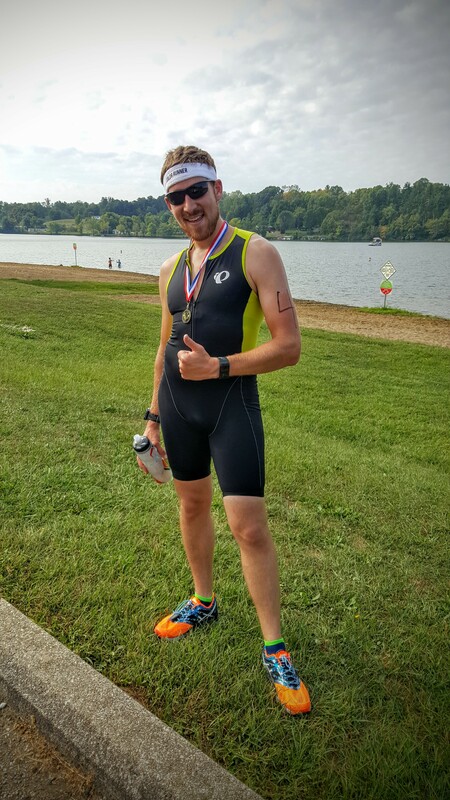 I completed my first Sprint distance triathlon last September and wanted more. I was out of shape and rocking a dad-bod. This challenge was twofold. It would help me get in shape and it would help me accomplish some of my life goals. That was what I thought initially, but it ended up being so much more. As I mentioned earlier, I did a Sprint distance race last September. I had just bought my bike earlier in the year and I thought that race was rough! I signed up for an Olympic distance race at the end of June this year, but unfortunately, the swim portion of the race was canceled due to flooding. I still competed in the duathlon, but felt like it wasn’t a full race. 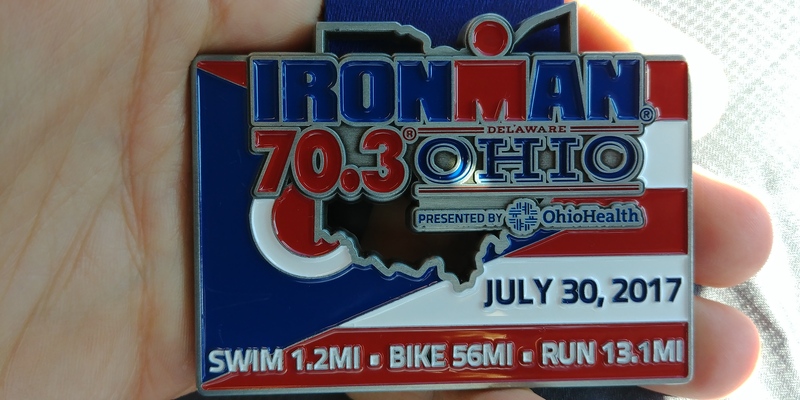 I had signed up for the Ironman 70.3 Ohio back in December of 2016. At that point I had only one Sprint under my belt and I thought my sanity had lapsed. One of the things that this experience has taught me was discipline. I’ve never been a particularly disciplined person. My friends know that I am more of a “fly by the seat of my pants” type. I was so nervous about my race, that all of that changed. I started planning each and every week around my training schedule. I said no to plans on Saturday mornings that would interfere with my long workouts. I left events early so that I could get to bed on time. This experience really changed me in ways beyond fitness. When July 30th, 2017 (Race Day) finally came. I had an odd sense of calm. I woke up before my alarm went off at 4am and started getting ready. Coffee was already waiting for me downstairs and I ate a nice breakfast before heading to the race start. We had to be out of T1 (Transition 1, swim to bike) by 6:45am, but my wave didn’t start until 8:12am. So I had a lot of time to kill. I hit the porta-potties multiple times and made friends with some of the more veteran triathletes. As my wave time neared, I put on my wetsuit and got ready. (I was very happy they announced at 5am that the race would be wetsuit legal by .2 degrees!) I assumed that I would be part of the slow group. So I lined up in the very back. This was my first mistake of the race. Swimming in a huge group is difficult enough, but trying to maneuver around people and pass them is even more difficult. After the first turn, the swim headed directly into the sun. This made it almost impossible to see the buoys. So my swim was all over the place and added a couple hundred extra yards to my 1.2 mile swim. When I ran up the beach into T1, it was already mostly empty due to how late my wave was. I hopped on my bike and took off for the 56 mile bike ride. The weather felt great and I had remembered to actually kick my legs during the swim. So they were warmed up for the bike. This was my first experience with biking aid stations. Trying to grab a water bottle from someone while you are going 15 mph on a bike can be pretty difficult. Luckily, I didn’t wreck! I started to feel a little fatigue in my legs around mile 46, but pushed on. At mile 50 while going down a big hill, my chain popped off. I had to pull off to the side and put it back on. I quickly finished the last 6 miles and headed into T2. As I sat down to put my shoes on at T2, I was already tired and I could feel the mid-day sun blasting down on me. It had gotten hot and the temperature was almost 90. The run was brutal with very little shade and I hit a wall at mile 2. 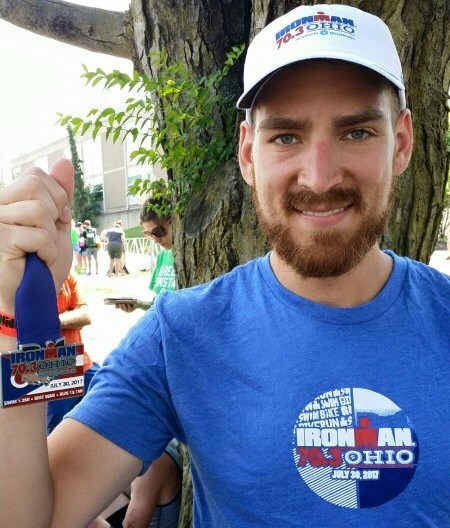 I had to run-walk the rest of the half marathon and was disappointed in myself. The run seemed to drag on forever at my slow pace, but the other athletes were so encouraging. Everyone I saw was also doing a run-walk due to the heat. When I finally was on the last mile heading back to the stadium, I got a second wind. I knew my family was waiting to cheer me on and when I finally saw them my heart soared. I sprinted around the stadium track to finish. A wave of relief washed over me. I almost felt like crying. I had trained so hard for this and I did it. I completed it. Unfortunately, I missed my goal time by 9 minutes due to my very slow run split, but I finished. It just means that I will have to come back next year and do even better! I always used to believe that people that competed in these endurance races were crazy and superhuman. I didn’t think that I would ever be doing one, but now I have. It just proves the old mantra that you really can do whatever you set your mind to. You just have to have the self-discipline. So get out there. Set a goal. Then crush it! It’s been my dream since I was a kid to compete in a triathlon. Swimming was my favorite event to watch in the Olympics, I always enjoyed biking, and I’ve always admired distance runners (although I typically hated doing it myself). Putting all three of those events together seemed like quite a feat. Previously, the main thing that had held me back was my lack of a good bicycle. In my previous post, I mentioned that a friend of mine found me a great used bike that I purchased and used to train for/ride in Pelotonia. 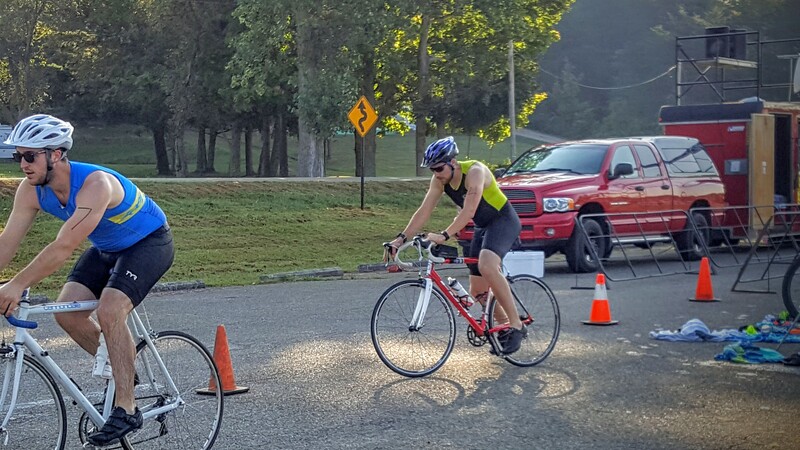 After I proved to myself that I could train for a bike race farther than I had ever ridden before, I decided that it was time to sign up for my first triathlon. Triathlons come in many different styles and lengths. 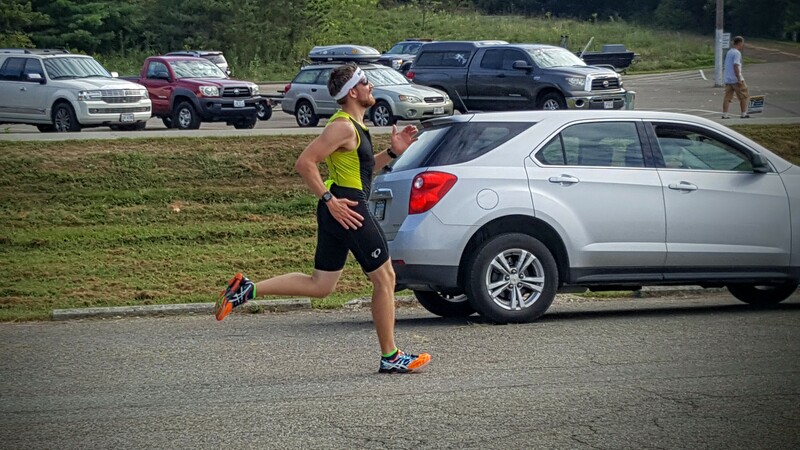 For my first one, I decided to start out easy with a Sprint distance Triathlon. 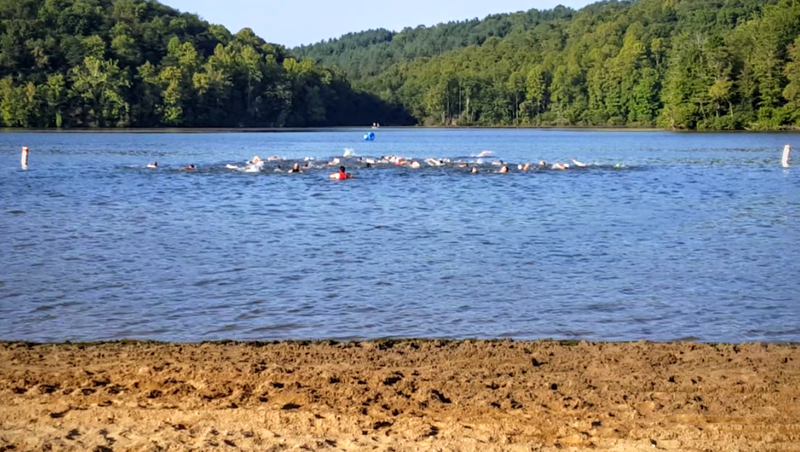 This race was was a 1/4 mile swim, a 12.4 mile bike ride, and a 3.1 mile run and the competition was to be held in Hocking Hills, Ohio. The race was set to kick off at 9am. So I got up at 5:50am to eat a big breakfast and let it settle before the race. I also wanted to get there early to setup my transition area and survey the course. When I arrived about 8am, there were already quite a few people there. I went to registration to sign in, get my shirt, and get inked with my race number. My only goal was to finish the race, but even so, I started to feel some nerves set in. They called everyone together for some announcements and rules, then lined us up on the beach. A timer counted down and we were off for the swim! Even though the swim was “only” 400M, I was exhausted and winded. I’ve never swam with that many people before. It made the water choppy, people were accidentally grabbing/kicking me, and I really had to focus on where I was going. I got out of the water towards the front of the pack (to my surprise) and headed into Transition 1. 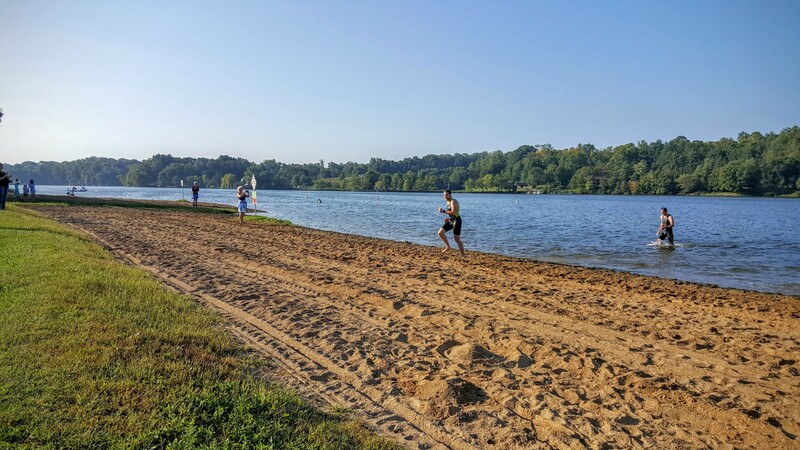 When I practiced transitions at home, I never practiced running through sand and dirt before getting to my transition area. My feet were filthy and I hadn’t accounted for that. I wiped them down as best as I could and jammed them into my bike shoes. As I stood up to grab my bike I heard a *CRUNCH* and realized I had just stepped on my sunglasses… (Note to self: don’t put sunglasses on the transition mat next time.) I jammed the broken lens back into the frame and hoped it would hold as I jumped on my bike. 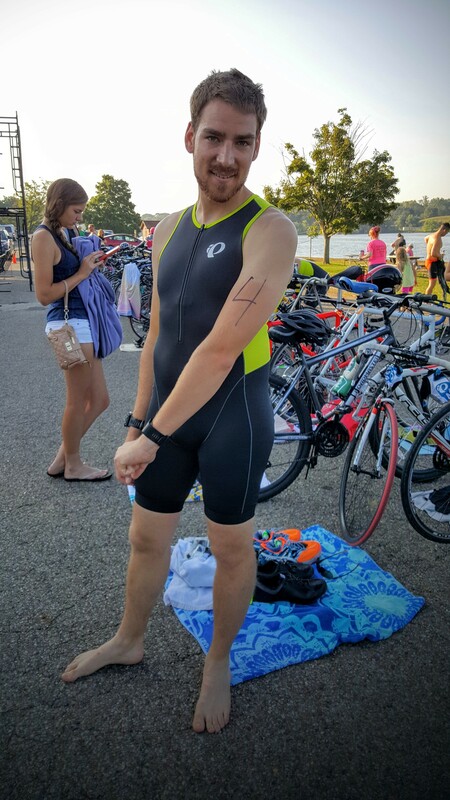 I was so winded from the swim that I immediately started questioning what I was doing in this triathlon for the first couple miles on the bike. Finally, I settled into my cadence and started feeling pretty good; that is until the half way point… The turnaround for the bike was at the top of a 300ft + climb at the steepest incline I had ever attacked on my bike. My heart rate was spiking at almost 180, I couldn’t breathe, and I felt like I couldn’t even get my bike to budge while standing on my pedals in my highest gear. My speed slowed to a crawl, but it must have been just as difficult for everyone behind me because I did not get passed. When I finally reached the top and turned around, I hit over 40 MPH on my way down the hill and slowly started to get my breathing back to normal. I pushed it back to the transition area and changed into my running shoes. I kept a pretty good pace throughout the 5K despite feeling exhausted. As I was heading out on the run, I started counting the people coming back to try to get an idea of what place I was in (secretly hoping for top 10). Alas, top 10 was not to be, but as I saw the finish line, I eagerly sprinted in to see my place and time. I finished in 13th place (out of about 60 people) with a time of 1:18:24. It was an amazing experience and I felt such pride as the realization of what I had just accomplished hit me. Now I’m looking ahead to 2017. 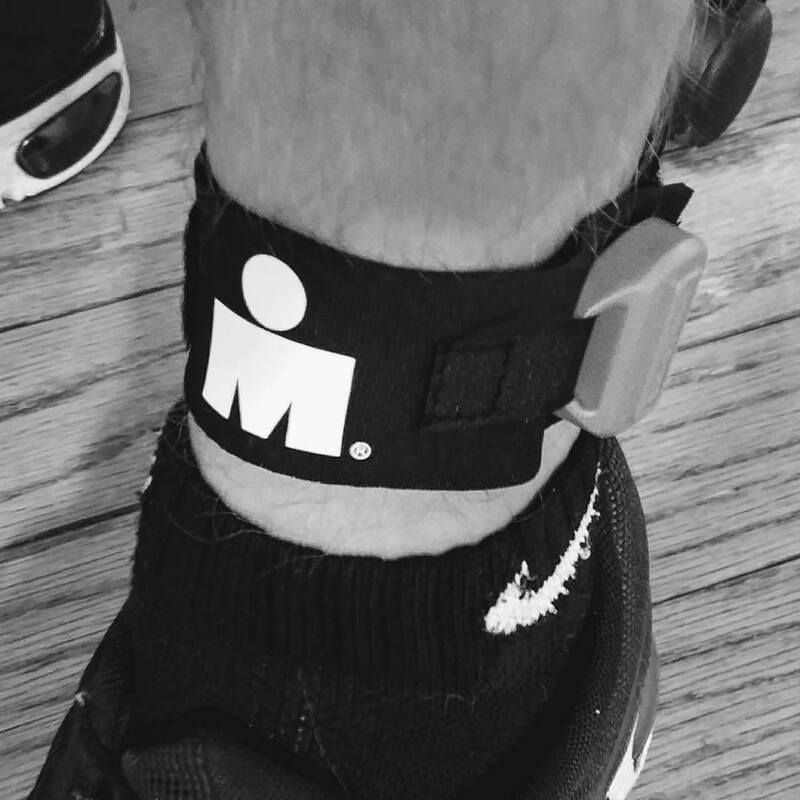 If all goes as planned, I’d like to do another Sprint Triathlon, then move up to an Olympic distance Triathlon, and finally compete in a 70.3 Ironman (1.2 mile swim, 56 mile bike, 13.1 mile run). Let’s see if I can do it! What have you always dreamed of but have been too afraid to try/didn’t have time/insert other excuse here? Tell me in the comments and then get out there and attack it!